Tuesday, October 31st is Halloween! We are sending you a Haunting Little Hello to let you know that we have a scary large assortment of Gore-Met Gift Baskets for Ghouls and Boos of all ages! Also check out our Funny Bone basket featuring a Seinfeld Halloween book with CD. 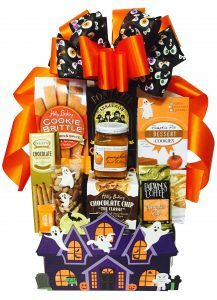 As always, you can give us a call if you would like to have us custom design and personalize a Halloween Gift Basket for a child, friend, family member, employee or client.